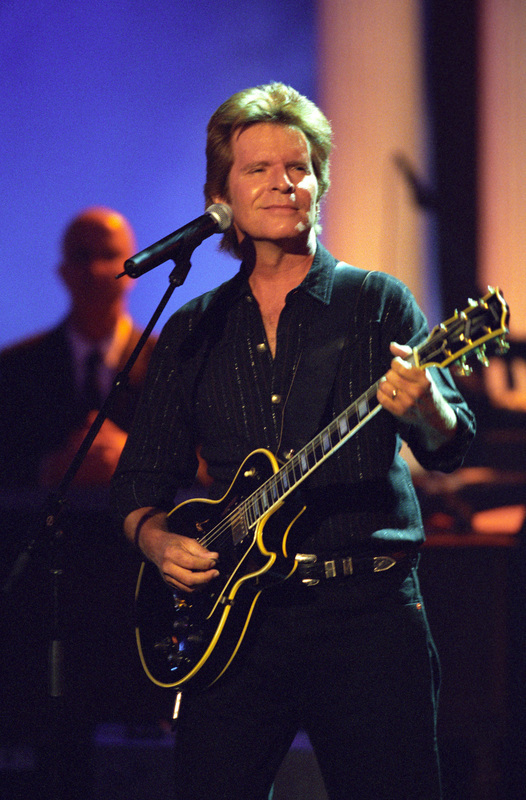 Photo of John Fogerty playing his guitar at the VH-1 Save the Music Concert, which took place on October 23, 1999 at the White House. Other performers who joined Fogerty at this event included John Mellencamp, Al Green, Melissa Etheridge, and B.B. King. A dedicated rock’n’roller most closely associated with the 1960s and 1970s as the guiding force behind Creedence Clearwater Revival (CCR) and who since then has pursued a stellar solo career, John Fogerty celebrated his 73rd birthday on May 28th. He is an accomplished guitarist (number 40 on Rolling Stone magazine’s list of the 100 Greatest Guitarists), singer (number 72 on its list of 100 Greatest Singers) and songwriter inducted into the Songwriters Hall of Fame in 2005 and the artist responsible for such hit singles as “Proud Mary,” “Down on the Corner,” and “Fortunate Son.” On his own Fogerty most likely will be remembered for composing “Centerfield,” an anthem for America’s pastime played at baseball games to this very day. The path that would eventually lead to the formation of CCR and musical renown for Fogerty began in the late 1950s and early 1960s while he still was a student in junior high and high school. He grew up in the San Francisco Bay Area of California, principally in the towns of Berkeley and El Cerrito. A cover band called the Blue Velvets came into existence in 1959 when Fogerty teamed up with bassist Stu Cook and drummer Doug Clifford. John’s brother, Tom, later joined the group; with that addition to the lineup the final piece of what would become CCR and emerge as one of rock’n’roll’s finest creations seemed primed to carve a niche for itself in California. But it would take several years before the four band members acquired any attention and literally became a singles machine that transformed the face of popular music. In 1964 the Blue Velvets signed with Fantasy Records. A record executive at their label came up with the bright idea of changing the band’s name to something known as the Golliwogs. Undoubtedly not helped by getting saddled with such a crazy name, Fogerty’s group released seven singles that did nothing commercially and disappeared without a trace. Amidst this sea of uncertainty and rough beginnings, Fogerty had to worry about the Vietnam War and the possibility of doing military service. He received his draft notice in 1966 and without any delay reported to a local Army Reserve recruiter. By all accounts this individual apparently sympathized with the young man and took actions that kept Fogerty out of harm’s way. He decided to make sure that the aspiring musician got placed in a Reserve unit immediately and, at least in Fogerty’s eyes, may even have dated the paperwork a few days before the arrival of his draft letter. It meant he could achieve the required military service by doing stints at Fort Bragg, Fort Knox, and Fort Lee; there would be no military action for him in Southeast Asia. Things started happening in quick succession in 1967 upon Fogerty’s discharge from the Army and the change of the band’s name from the Golliwogs to Creedence Clearwater Revival. Fogerty, in essence, assumed control of the group, becoming its lead singer and guitarist, primary songwriter, and only decision maker. CCR released seven studio albums during the relatively brief period of 1968-1972. They were, in chronological order, Creedence Clearwater Revival (1968), Bayou Country, Green River, Willy and the Poor Boys (1969), Cosmos Factory, Pendulum (1970), and Mardi Gras (1972). Altogether these LP’s have sold 15 million copies as certified by the Recording Industry Association of America (RIAA), with five of them peaking in the Top Ten of the Billboard 200. 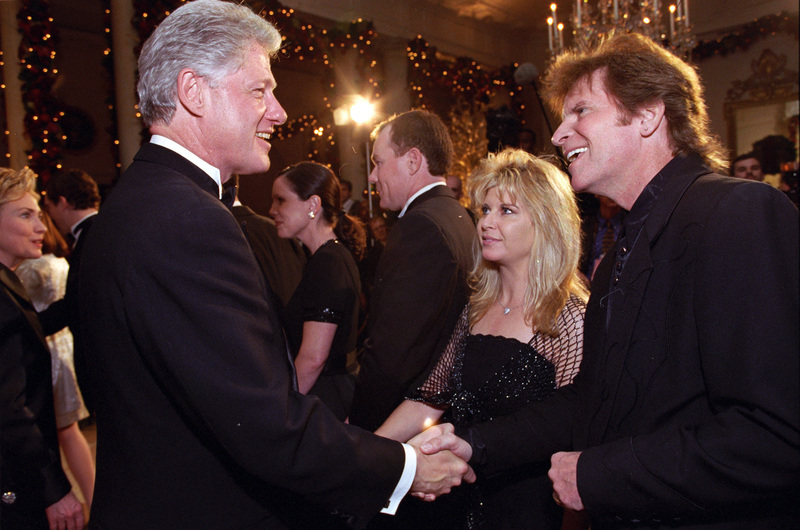 John Fogerty and his wife, Julie, shaking hands with President Clinton at the Millennium Celebration Dinner held at the White House on December 31, 1999. Fogerty has been married to Julie for 27 years. He [Fogerty] rasps out the lyrics. . . in a voice filled with bile and uses his guitar as a weapon to run machine-gun stitches right through everybody who’s ever abused a privilege. I don’t know if that’s a good definition of rock’n’roll, but it’s a hell of a start to my idea of democracy in action. The final years of CCR proved to be a contentious period for Fogerty. The other members of the group wanted more of a say in decisions they perceived as effecting everybody’s welfare; resentment began to build over Fogerty’s insistence that his opinion counted for more than those of his brother Tom, Cook, and Clifford. These festering issues caused Tom Fogerty to leave the band in January 1971. Everything sort of came to a boiling point during the sessions for what proved to be CCR’s final studio album, Mardi Gras. The record clearly wasn’t up to their previous standards, but it sold enough copies to be deemed a commercial success. Still, nothing could hide the hostility within the group; CCR officially disbanded on October 16, 1972. Fogerty’s solo career can best be characterized as fitful and sporadic in nature. 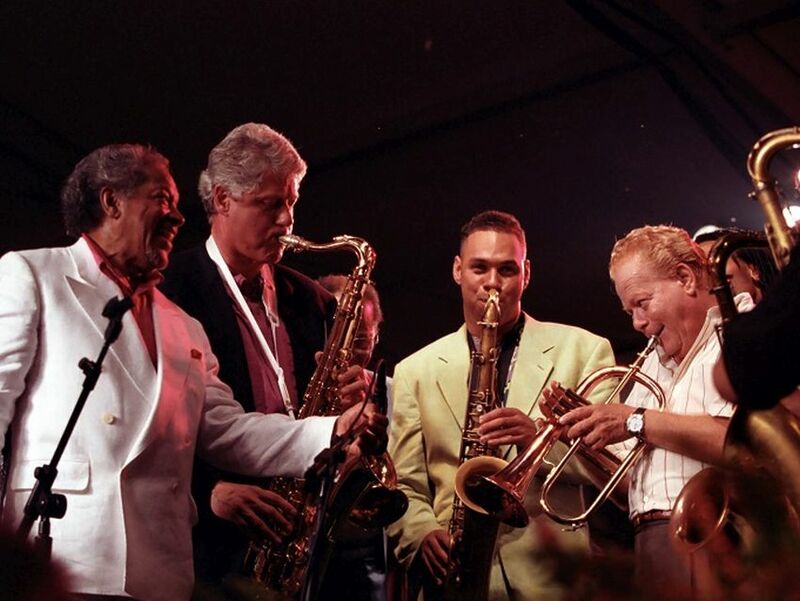 However, there can be no question about the overall excellence of the albums released by the 1993 inductee into the Rock and Roll Hall of Fame as a member of CCR. Releasing a new album on the average every 4-5 years, Fogerty has managed to put out nine LP’s during a forty year period (1973-2013). His initial foray as a solo artist, The Blue Ridge Rangers (1973), featured him as arranger and producer; he was also credited with playing all the instruments on the record. This album consisted of country and western covers and turned out, on the whole, to be a modest success. What can be viewed as Fogerty’s first official solo album, John Fogerty saw the light of day in 1975. His debut did only marginally better than its predecessor, but the LP spawned “Rockin’ All Over the World,” which peaked at #27 on the singles chart. 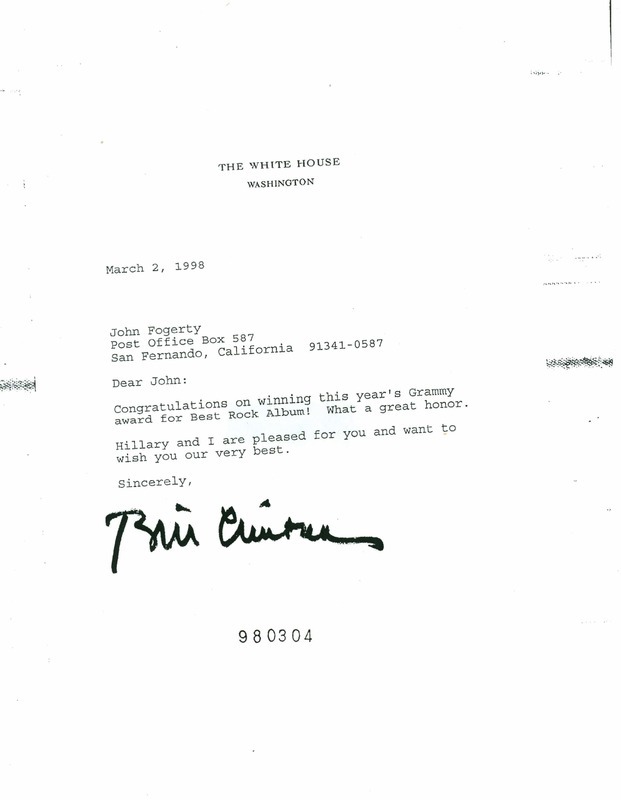 This document from our collection is a congratulatory letter from President Clinton to Fogerty upon winning a Grammy for Best Rock Album. This award was for Fogerty’s 1997 release Blue Moon Swamp. The question that dogged Fogerty when he started touring as a solo artist was at what point CCR songs would become part of his performance. All throughout most of the 1980s Fogerty refused to include CCR material in any concerts he did. However, Fogerty relented from this steadfast refusal on at least two occasions—on July 4, 1987 in Washington, D.C. at a show for Vietnam veterans and on May 27, 1989 at Oakland Coliseum for the Concert Against AIDS. Fogerty didn’t begin doing CCR songs on concert tours until well into the 1990s.